Which show to audition for? For each production, there’s some overlap in ages. In other words, anyone age 8, 9, 12, 13 or 14 can usually choose between two shows. So, which should they choose? Little Kids on Stage! productions are designed to give children under 10 some bigger roles and more time on stage. These productions are performed at the New Britain-Berlin YMCA where we can set up seating for about 75 (plus a little standing room). There are usually fewer than 20 children in the cast, and we try to give everyone a role with some lines. Rehearsals are once or twice a week and usually from 6:00-7:30 pm. (In the final days before the show, rehearsal is often held every night.) For both Little Kids on Stage! and Kids on Stage! productions, children usually have nothing to prepare for auditions. They’ll audition in groups to meet the directors, play some games to see how they interact and take simple direction, and will read a little from the script. Kids on Stage! productions will be performed this season at Holmes Elementary School (in New Britain on the Farmington border) in an auditorium with over 200 seats. There are usually 25-40 children in the casts, and many of the cast members may be in an ensemble or chorus. We do, however, try to choose plays and musicals with as many lead and featured roles as possible. Rehearsals are once or twice a week and usually from 6:00-8:00 pm (and every day during the last week). Teen Company productions are most like adult community theater. Actors auditioning may be asked to prepare a monologue (plus a song for musicals), and will likely read from the script and may even have to dance for musical auditions. The cast size will be determined by the scripts’ needs, so sometimes not everyone can be cast. Rehearsals are held once or twice a week from 6:00-8:00 pm, but sometimes may go longer or a third rehearsal night might be added. The venues for Teen Company productions often change for each production (at least until NBYT has a venue of its own). 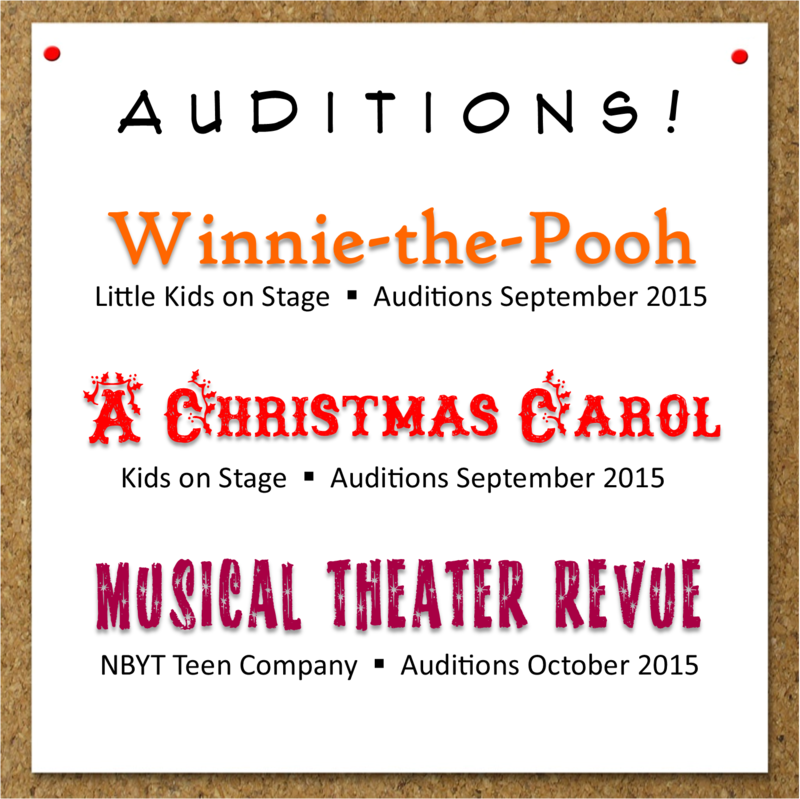 Auditions this season begin with Winnie-the-Pooh on September 8 and 10 for ages 6-9. Auditions for A Christmas Carol are scheduled for September 17 and 22, and will go up to age 16 since there are many demanding roles for teen actors. Auditions for a Teen Company musical revue will be held in the first week in October, and Musical Theater Audition Skills Workshops (for ages 10-18) will be held just before those auditions. If you have any questions that this post hasn’t answered—or if you’d like to schedule an audition—email auditions@nbyt.org or call 860-515-8115. Previous Previous post: Parents, help NBYT as a Parent Liaison! NBYT Which show to audition for?